A battery container is presented which provides multiple configurations that allow the storage of cylindrical or rectangular batteries in a magazine and ensures the maintenance of a consistent orientation, easy access, and physical protection of the batteries. The battery container is further adaptable to provide easy recharging of the batteries. The battery container is additionally configurable to be connectable with other battery containers, allowing the easy storage and distinguishability of charged and discharged batteries. The convenient storage for discharged batteries increases the likelihood that more batteries will be retained for proper disposal, rather than being discarded on the ground or in an improper location. A dry-cell battery container is presented in shape of a spring activated transparent magazine, which provides multiple configurations that allow the retail & storage of cylindrical or rectangular AAA, AA, C, D, & 9V dry-cell batteries. The uniform single- or double stacking insures a consistent pole-orientation, easy access, and physical protection of the batteries. Stacked batteries are easily removed, one battery at a time w/ light thumb pressure. The magazines already filled w/ the non- or rechargeable batteries can be retailed to the consumer as a complete package, which will improve the battery organization & safety greatly after purchase. Used, non-chargeable batteries can be stored in the magazine, returned for exchange & recycling. Magazines for rechargeable batteries will be manufactured with an economical and practical integrated intelli charge system (120V, 12V, and/ or solar panels, which prevents overcharging and allows any number of batteries in different load stages to be evenly charged directly in the magazine w/o removal. Millions of battery users of all ages have now an easy, safe, & organized access to fresh, pole-oriented batteries in one magazine. No more rolling back & fore in drawers or loosely stored in pockets, pouches, boxes, etc. Battery-Magazine works w/ same principal like a spring activated mufti-round gun magazine. Due to the modern polymer industry, the Battery-Magazines can be extremely cost-efficient mass-produced. Vast amounts of the Battery-Magazine can be easily & economical mass- produced, because ammunition magazines with different capacities and materials are already mass produced. Only dimensions of the Battery-Magazine and the thumb-operated top-lip feeding mechanism are changed. 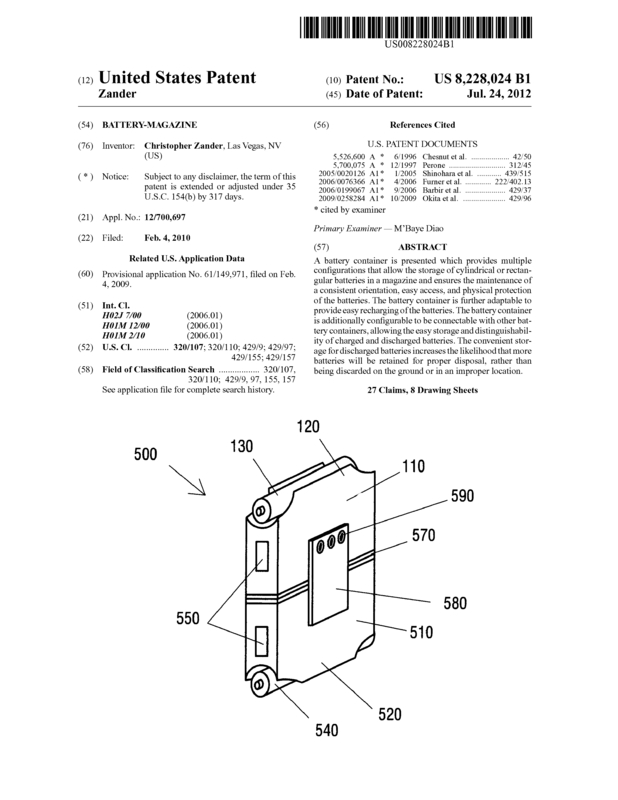 Page created at 2019-04-25 17:59:39, Patent Auction Time.